The deal involves purchase of 24 per cent stake in Jet by Etihad and other tie-ups. New Delhi: In fresh troubles for Indian carrier Jet Airways' alliance with Abu Dhabi's Etihad, fair trade watchdog in Singapore has begun a scrutiny of the deal to probe any possible violation of its competition laws. The deal, which involves purchase of a 24 per cent stake in Naresh Goyal-led Jet for about Rs 2,060 crore by Etihad and other tie-ups, has been going through turbulent times ever since it was announced more than a year ago in April 2013. After months of scrutiny, the deal got consummated late last year after clearance by various Indian regulators including fair trade watchdog CCI (Competition Commission of India) and capital markets regulator Sebi. However, the deal has now come under the scanner of the Competition Commission of Singapore (CCS), as the alliance "relates to the provision of international air passenger transport services (and associated support services), with a specific focus on the Singapore origin and destination city pairs". The CCS said in a notification that it was seeking feedback from the public and other stakeholders till July 11, after which it would take its final call on the deal. The notification was issued "in relation to Section 34 of the Competition Act which prohibits agreements between undertakings, decisions by associations of undertakings or concerted practices which have as their object or effect the prevention, restriction or distortion of competition within Singapore." The CCS further said the Jet-Etihad alliance "includes pricing, route and schedule coordination, marketing, code-sharing, networks, customer service and resourcing decisions between the parties. resources, better customer services and efficient administration of the Parties' respective businesses," it added. Abu Dhabi-based Etihad is the national airlines of the United Arab Emirates and it operates to over 85 passenger and cargo destinations in over 50 countries. Jet is a leading airline in India, operating to over 50 domestic and 20 international destinations. The two carriers are members of any of the three major international aviation alliances (Star Alliance, oneworld and Sky Team), CCS said. The CCS is a statutory board functioning under the purview of the Ministry of Trade and Industry of Singapore. The Competition Act of Singapore empowers the CCS to investigate alleged anti-competitive activities, determine if such activities infringe the Act and impose suitable remedies, directions and financial penalties. The CCS scrutiny comes at a time when Jet Airways has announced a major restructuring. programme including significant cost-cutting measures to attain profitability, while it has also begun tapping synergies from Etihad deal. Struggling under high expenses and adverse operating conditions, Jet Airways posted its highest-ever annual loss of Rs 4,129 crore in the fiscal year ended March 31, 2014. Forced to take tough measures, Jet has adopted a three-year business plan, which includes cleaning up of balance sheet, pruning of over-valued assets, cost restructuring and changes in service and fleet plans. These decisions, as also the appointment of Australian national Cramer Ball as new CEO of Jet, were taken at a board meeting on May 27, which was attended for the first time by representatives of Etihad Airways. The carrier posted a net loss of Rs 2,153 crore for the quarter ended March 31, 2014, which was its fifth straight quarterly loss. Etihad's investments in Jet, totalling USD 750 million, comprises Rs 2,057.66 crore (USD 380 million) for a 24 per cent stake in the company, USD 70 million towards purchase of three slots at London Heathrow airport, USD 150 million to secure a 50.1 per cent stake in the JetPrivilege Frequent Flyer Programme and USD 150 million through HSBC. After last board meeting, Etihad CEO James Hogan had said that Etihad was "a long-term strategic investor and committed to supporting Jet as it re-engineers its business to achieve sustainable profitability." In another relief to the deal last month, Sebi also ruled that the Abu Dhabi-based carrier does not have to make an open offer for Jet shareholders pursuant to the Rs 2,060 crore deal. Sebi's long-running probe had centred on the contention whether Etihad was getting control despite purchasing only 24 per cent stake. 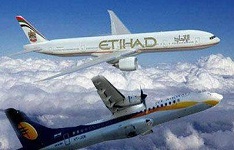 After looking into various aspects, Sebi finally ruled that Etihad "has not acquired control over Jet". Under the Sebi norms, an entity acquiring control in a listed company has to make an open offer to the target firm's shareholders. The deal was incidentally restructured last year to address various "control" related and other concerns raised by Sebi and the CCI. While clearing the deal, the CCI had, however, observed that Etihad was getting "significant rights" and "joint control" in running Jet Airways. The two carriers later petitioned the CCI to remove this observation, but the plea was rejected. Following Competition Commission's observations, Sebi had decided to have a fresh look at the deal.